Once Massachusetts Institute of Technology garnered funding to expand their early education program, they wished to enroll kids as soon as humanly possible. D. W. Arthur Associates developed a light-filled modular solution that sits playfully in its urban context. One year later, 126 more children can kiss their academic parents good day and collaborate on research projects of their own. 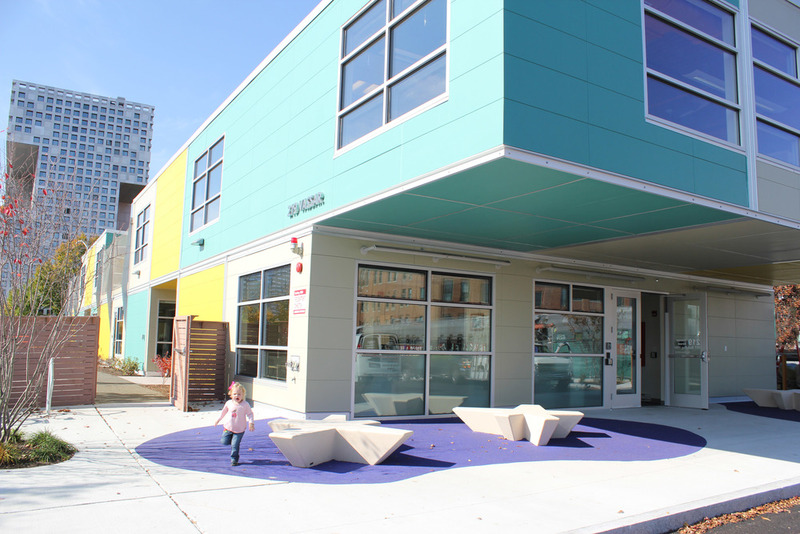 Massachusetts Institute of Technology has expanded their on campus child care program for current and prospective faculty, staff and students utilizing an off-site pre-fabrication process for the construction of a new building. This direction was pursued in order to meet an aggressive construction schedule, as well as to minimize logistical challenges related to traditional construction delivery methods on a compact site in an active urban setting. With both constraints and opportunities for design, the modular construction system afforded a unique opportunity to create an uplifting, light-filled environment offering a variety of spatial experiences. The 13,400 square foot building is comprised of 21 modules and serves 126 children. In the design of the center, D. W. Arthur Associates chose to articulate and integrate the construction modularity both volumetrically and in the details. Taking advantage of the inherent structural properties of the steel framed modules, three modules were rotated and cantilevered over the front entrance providing much needed weather protection below while also doubling valuable rooftop outdoor playspace at the opposite end of the structure. Various modules were made shorter to create recessed porches which enhance the indoor-outdoor continuity fundamental to the early education program. A precise and holistic detailing system was developed, utilizing extruded aluminum channels to provide a refined detail resolution at each interface where modules abut. 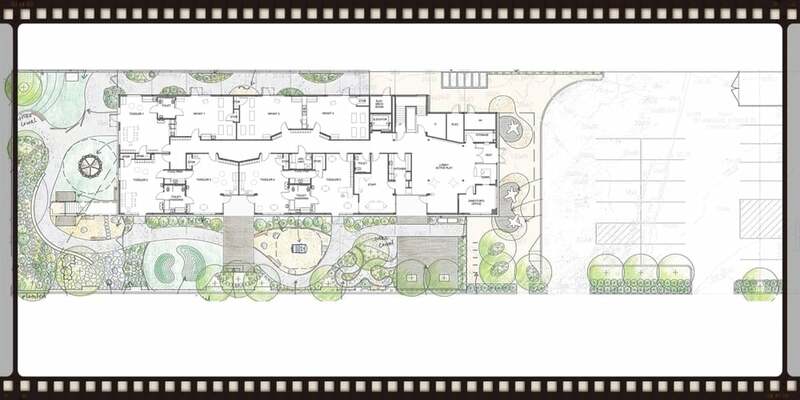 The building volume is carefully configured and situated on the constrained site to maximize activity space for children both indoors and out. 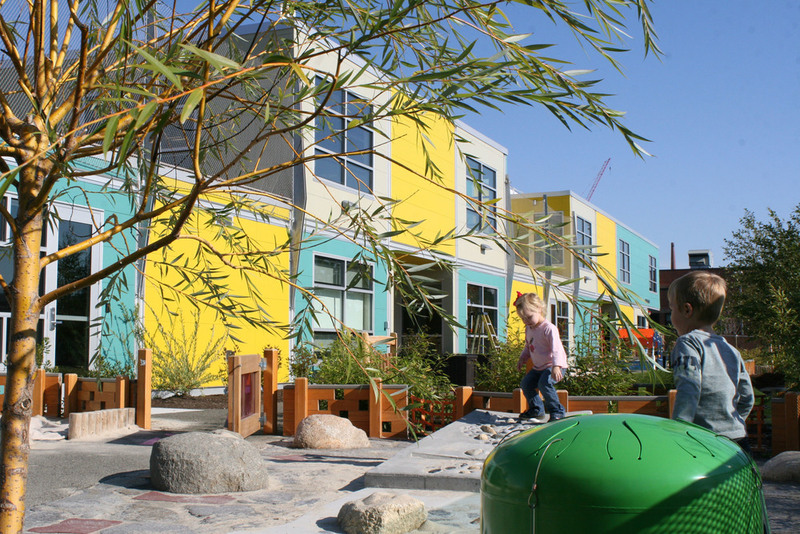 Direct connections from classrooms to age-appropriate exterior playgrounds enable continuity of activities and encourage outdoor exploration. Recessed porches at the ground level create semi-protected transitional spaces with wood deck surfaces extending out into a naturalized play environment. Playgrounds are carefully arranged and designed to afford a variety of play opportunities, including water and sand play, pathways through vegetated areas, hillocks, and other elements, in addition to climbing equipment. The second floor of the center includes three preschool rooms and a roof deck. An open outdoor stair connects the roof deck to the main preschool playgrounds, providing a continuous spectrum of play opportunities. The roof deck is equipped with a network of overhead cables from which fabrics can be suspended horizontally and vertically. These can be adjusted for shading purposes, and also to create a range of spatial experiences. Utilizing translucent fabrics, light and shadow play and dramatic play are readily encouraged. This deck and the recessed porch on the south side serve as vertical gardens as well, supporting learning activities with plants and natural processes. Young children learn through engagement with and exploration of their environment, and D. W. Arthur Associates’ design is intended to support the concept of “the environment is the curriculum.” The variety of spatial experiences in the two story center includes a multipurpose room used for all age groups, a library with a reading aerie extending out over the stair, and a rooftop play deck. The celebrated modularity of the building construction is continued from the exterior to the interior through exposed and uniquely colored structural elements, particularly in the exposed ceilings. Within this enclosure partitions are inserted with more subdued finishes to create distinct activity spaces and to support the display of children’s creative production. Click here to watch the Animated Design Story of the David H. Koch Child Care Center at MIT, a compilation of the clips to the left.